September 15-21st is truck driver appreciation week. My husband is a truck driver. He has been driving for many years. Each and every day he is out he faces obstacles and stupid drivers. An ongoing comment around our house is that if a plane went down in the middle of the ocean, it would be because of a truck driver. Truck drivers get a bad rap most of the time. I know I have heard some pretty sad and inaccurate things about truck drivers. Some people think that a truck driver has a women in every port (truck stop), and that is far from the truth. Some people think that because the truck is so big that they are driving carelessly and without regard for the safety of others. When most times it is smaller cars that cause the accident by cutting off drivers and not giving enough time or space. Driving a big truck is not as easy as it may seem and the industry is highly regulated when it comes to the size of the truck, weights, hours driven and so forth. Each driver in this industry has to pass physicals and go through testing. I will concede that there are some horrible drivers out there that never should be on the road. There are more good and honest drivers than bad. They are trying to make a living like anyone else. It is a job to them and for their families it is a difficult lifestyle. These families give up a lot of time with their spouses and families so everyone can buy the things they need and to keep the economy going. For the most part it isn’t just a day they are gone from home, it is weeks and months on end. My husband would be gone for weeks on end and he missed many family events and school things for my girls. But we knew what we were getting into before he chose to drive truck. It isn’t for those who can’t be both the mom and dad while the dad is working. Truck drivers are highly-skilled and bring to us the food, medicine, toys, household goods and equipment that we need to live. Think of the what is involved driving in varying conditions – through rain, fog, snow and scorching temperatures, black ice and whatever may come – it takes additional skills above and beyond driving to get the mail delivered that has to weather these conditions. Truck drivers do too! Not to mention having to interact with non-professionals in passenger cars and on motorcycles. It isn’t just the postman that has to drive in these conditions. My husband has been working for Andrus Transportation for over 18 years now. Even though there have been a few glitches, but for the most part they have been great. 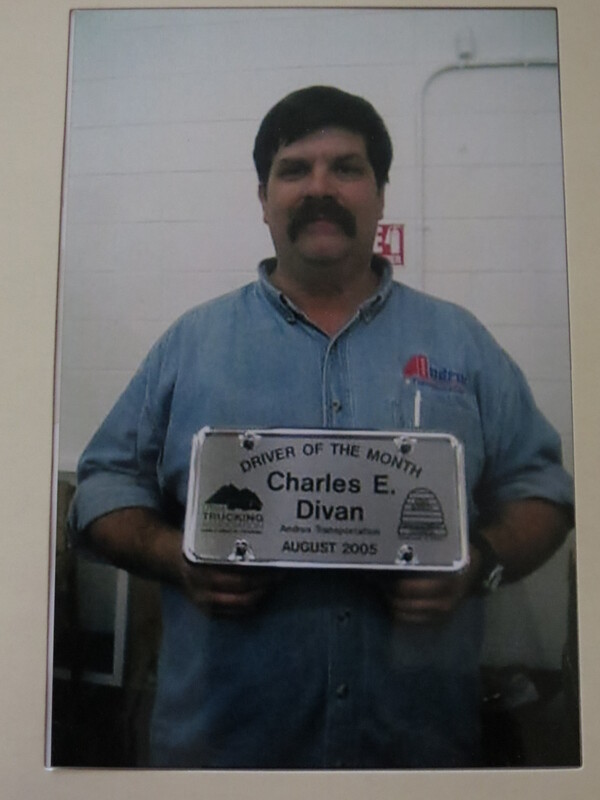 Chuck was the driver of the month in August 2005 for the state of Utah. When I think of the good at Andrus, I think of the people that work there. When my husband first joined Andrus Lynn Shrum was the recruiter that hired him. She is still there and is very much on the ball. She has heard a number of my rants and getting upset. I adore Jim Black and Susan (no longer there). If I needed to know how to get a hold of Chuck or where he was, I could call them up and they were happy to help. Jim Black is still there and even though he is no longer Chucks dispatcher, I still call him. Jim and Mary Andrus are the owners of Andrus Transportation and they are wonderful people that value family and are strong their faith. Speaking of dispatchers and recruiters. It takes these very important people to get the loads going and route the trucks. It takes the mechanics to keep the trucks running safely and efficiently. It takes payroll to keep us wives and drivers happy on payday. I had to throw that out there, lol. There is much to the trucking industry that others don’t see. It takes a whole lot of people to get us the things we need. Andrus goes out of their way to show appreciation to their employees and i want to thank them for that. It may not seem like you are appreciated, but you are. A closing thought before providing some links is that there are good companies and drivers and there are bad companies and drivers too. I put a couple of videos of actual drivers and what they experience on the road. I don’t know these drivers and they don’t work for Andrus. Just thought you would be interested to get a first hand look into the lives of a truck driver. a Week in the Life of a Truck Driver- 1st in a series. Look for links for follow ups.